Welcome to the new year & I am on spot this time around – not posting recipe right away. 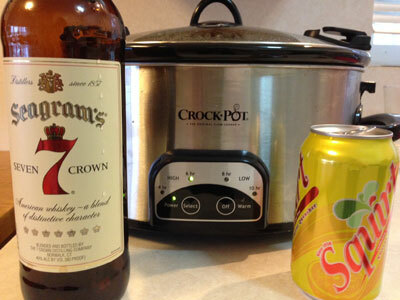 But, some of this had to do with the first picture & drinking throughout cooking time… best drink name ever! Was doing some reminiscing about childhood & thought of my mom making these chicken pepperoni rolls that were freaking amazing. In line with the old days, her’s were dunked in bread crumbs & cooked in deeply oiled skillet. 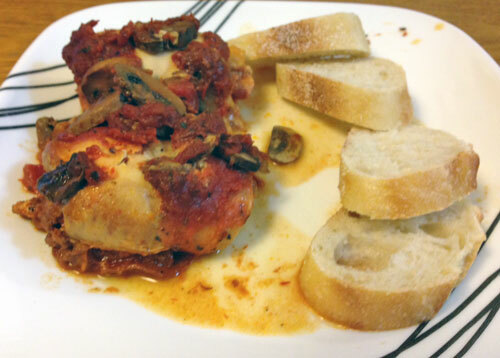 Delicious of course, yet was wondering if I could find a way to do this in the slow cooker & cut down the greasiness. Really didn’t find any other recipes out there for the crock so decided to just wing it & if dish didn’t turn out – hit up a restaurant. 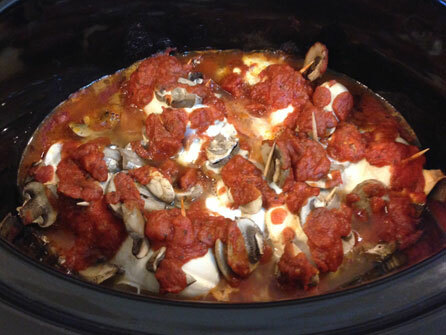 Spread 1/3 of the jar of pizza sauce in bottom of crock. Lay all chic breasts out on cutting board for prep. Put about 5+ slices of pepperoni on top of each breast. Cut the cheese slices in half & lay on top of chicken/pepperoni. Roll each of breasts up – rolling away from you is the easiest. This is a tad tricky, you’ll have to take time to keep it all together. Put a couple toothpicks in each roll to keep together & place in the crock. Spread the white mushrooms over the top of the rolls. Pour rest of jar of pizza sauce over everything. Cook on Low for 6-8hrs, check to make sure the chicken is cooked through. How did this turn out? Before we move on, remove toothpicks before consuming, but you knew that already… right? This turned out superb with tons of flavor. Glad that I went with the turkey pepperoni – I love pepperoni as much as the next person, but this definitely cut out the grease. The only thing that happened is that the cheese kinda leaked out of the roll into sauce which wasn’t a bad thing. Served with some crusty french bread to dip in sauce. Lastly, while writing this post I realized there are tons of add-on pizza toppings you could go for – depending how wilty/soft they would get, you’d add at different time during cooking: black olives, onions, green bell peppers (blech, go home you SOB), spinach, roasted garlic, anchovies (just on my side if you’re not down with these), clams or pineapple (nope, don’t even want you eating near me). Endless options. Thanks to all who have checked out the blog, my annual report said that this blog got over 3,500 hits this year with the Slow Pho Soup getting the most hits & most surprising – Spaghetti Squash & Meatballs was in top 5. Heres to a new year & I’ll keep on crocking out & I encourage you to do so also.